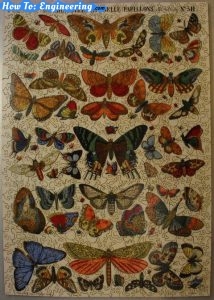 The image is printed in colorful butterflies of all sizes, while each shape is perfectly cut into dogs, people on bicycles and even more butterflies, it was a very fun and challenging puzzle. The puzzle has 608 pieces and the size is 12.75″ x 18.5″. The time spent on the puzzle was around 20 hours, spreading the time in about 2 weeks on spare time. Next Next post: Make a Pad lock rain cover.